All fees, tuition, or monitory amounts mentioned on this site are in U.S. currency. Commitment Deposit - $500.00. Non-refundable deposit must be submitted within three (3) weeks of admission notification. Proceeds apply as a credit to the tuition amount upon enrollment. 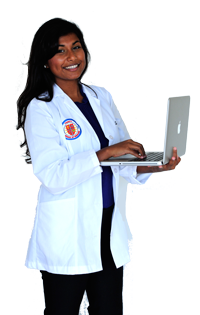 * The standard Five-Year Program includes one year (3 Terms) of pre-med course work. Some students may require additional course work in order to meet the MD program entry requirements. Tuition will be billed at then effective tuition rates for additional course credits. ** Tuition is subject to increase annually. All students will be billed each academic term at the tuition rates then in effect. Trinity provides textbook and supply schedules to assist students in securing the appropriate books and supplies for their term of study. Freshman students assuming a full schedule of courses should budget $500 to $600 to satisfy their book and supply needs. This amount may be less if the student is operating on a modified schedule or elects to purchase used books. Trinity maintains an approved online textbook order program that students may utilize to acquire books and supplies (see link on homepage). We encourage all students to utilize this service. Health insurance is mandatory while students are enrolled with Trinity School of Medicine. Trinity offers a Student Health Care, coverage is provided by Worldwide Expatriate Association (WEA). The cost of the policy is currently $660.00 per term for individual coverage (family and dependent coverage is available at additional premium). Students are automatically enrolled for individual coverage unless they provide proof of alternative coverage that is substantially equivalent to the Trinity plan. Students desiring dependent coverage are responsible for timely enrollment of dependents to ensure coverage. All Trinity students other than residents of St. Vincent are required to reside in University-provided housing during their Terms of study in St. Vincent. The University provides security, housekeeping, air conditioning and high-speed internet at all of its managed housing properties. The University may consider requests for exceptions to this policy in limited circumstances in which a student’s circumstances may not be adequately accommodated in student housing (family, full housing, etc.). A housing waiver fee may apply for students granted an exception from University-provided housing. Residence Hall applications are due no less than four (4) weeks prior to the first day of class. Students should budget $1,750 -$2,500 per term for food and personal expenses.